The saying "time flies when you're having fun" turned out to be the biggest understatement during my recent weekend getaway at Ilocos. After 8 hours of restless sleep in the freezing bus, we finally arrived at our first destination. "Welcome to Bantay, Ilocos Sur", the church keeper greeted us. He was a jovial looking man who took the effort to wake up at 5AM to meet us at the church grounds exactly thirty minutes after. Speaking in fluent english, he narrated the story behind the St. Augustine Church and the Bantay Bell Tower that were both standing so high and mighty ready for us, travellers, to explore and appreciate. Here at the Bantay Tower was where the movie Ang Panday was shot starring no less than the late Fernando Poe Jr.. 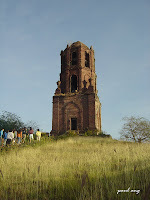 The Bantay Bell Tower was truly a sight to behold, its red brick colored facade shines as the early sunlight strikes it. Needless to say, Paul and I didn't waste any precious time was we allowed ourselves to go trigger happy just this once, just for this trip. After an hour of shooting and posing, something is starting to rumble and grumble. No, it wasn't the church or the picture pretty bell tower but it was our tummies reminding us that it's time for breakfast. Walking down the long cobble stone street was an experience in itself. We stop every now and then for a short photo op while peeking in pocket souvenir shops that sells over-priced native products that can actually be found at our beloved Greenhills tiangge. Then again, there might still be a small market who wouldn't mind the high price as long as the product is authentic or as it aims to be. As for me, I'm saving my money for the chichacorn, empanada and longganisa that Ilocos boasts of. We reached the end of the road that led us to another church, this time a modern-looking one, sandwiched in between two plazas namely plaza salcedo and plaza burgos. 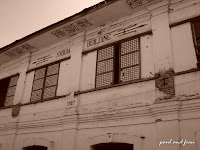 "Yan po yung Vigan Church" a by-stander pointed out when asked what was the name of the church. 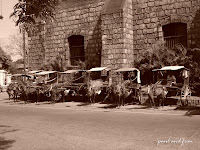 Beside the church is a line of colorful kalesas (horse-drawn carriage) with its respective kutchero (driver of the kalesas) standing nearby. After circling the two plazas and going in and out of the church, we began our short search for the empanada. Being a fan of Taco Ilocano here in Manila, I know I am not leaving Ilocos without trying the real thing. 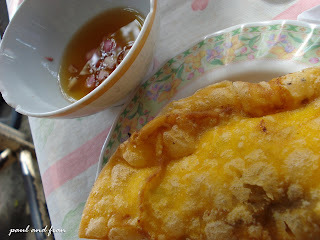 Ilocos' empanada, as my Ilocana colleage Gigi explained, must have chunks of longganisa, veggies and egg wrapped in a thin crepe-like dough and deep fried until it has a crispy golden orange texture. Thank God for friendly Ilocanos, the owner of a convenient store at Plaza Maestro suggested that we try looking for the stall that sells these delectable treats at Plaza Burgos. Crossing the not-so-busy street, it wasn't difficult to find it. Funny that we also bumped into three of our tour groupmates who were also in search of the same thing. We found out that Vigan has two types of empanadas. The regular with purely veggies inside (good news for vegetarians!) and special with the works (vigan longganisa and egg). For only P25 a piece, Paul and I got the special variant to share. Each empanada comes with a tube of vinegar. We quickly sat down at the table across the stall, opened our brown paper bag and placed our freshly deep fried empanada on a plate. We poured the vinegar in a small bowl and began to attack! Although I am not a fan of anything sour, I have to admit that I fell in love with this type of vinegar. It has the perfect combination of being sweet and sour (like me! haha kidding) that makes it soooo delicious! With an hour left before we are expected to head back to Villa Angela for lunch, our mini group has decided to take the trike and explore two more sites nearby -- the Panurbayan Jar Making Factory and Chavit S' Baluarte. We arrived shortly at the Jar Making factory and the potter was kind enough to demonstrate how he makes a jar. Paul was obviously fascinated with it while I was busy taking photos of the finished products displayed for stamping. 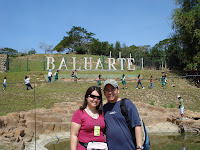 We thank Mr. Potter (hehe) and off we went to the Baluarte. I admit I was thrilled that we're actually going to see Chavit Singson's much-talked-about animal haven up north. The place was filled with kids having their field trip while us, 5 travellers, made our way inside. What I like about the Baluarte is that majority of the animals are free to roam around their man-made habitat. This said, I guess you can say that I'm totally against caging animals. Paul, who obviously is an animal lover, was in heaven! I literally had to grab his jacket to pull him away before he pets the ostrich or gets too close for comfort to the hungry looking tiger (yipes!). We were running a bit late but the place was sooo nice that we had to frequently stop for more photo ops. After a quick lunch at Villa Angela, we boarding our fancy pink bus and proceeded to our next stop: the Marcos Museum and the Batac Church. This was a quick stop and while everyone else went in to see Marcos' body, I opted to stay outside and take shots of the Batac Church instead. What caught my eye was the school beside the church. The sign read: Immaculate Conception Academy. I didn't know ICA has a sister school up north. Ü The group's done with their museum tour and we're back at the bus to the Paoay for the San Agustin Church. 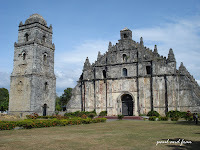 The church is one out of four UNESCO World Heritage Sites in the Philippines. It's bold stone structure makes it very picture pretty. "Built in 1710 under the direction of the Agustinian order,the ensemble of the church and detached bell towers are truly majestic in scale when viewed from the edge of the plaza that faces the ensemble. Detached from the church façade the bell tower tapers as it rises from the ground in a fashion reminiscent of a pagoda. The stone façade is plain at the bottom. Light, elegant decorative carving is applied close to the top of the pediment. A row of feathery stone finials that seem to gently brush the sky with delicate Oriental strokes accentuate the triangular top of the pediment. The earthquake protection system in this structure is probably its most dramatic feature. Exaggeratedly thick buttresses protrude quite a distance from the ground to be countered by a smaller volute near roof level topped by a stone finial. Swirling upwards to the sky, the massive stone buttresses take on a magical lightness." We're off to our next stop: the Malacañang of the North. Unlike the Malacañang Palace here in Manila, this political landmark up north overlooks a clean body of water. Looking out the veranda, I was simply at awe with the beauty of the garden and the lake. It somehow reminds me of the mansion of Capt Von Trapp of The Sound of Music. 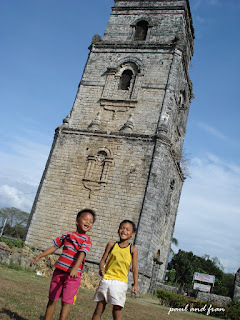 Our last stop before finally heading off to Pagudpud was the Sinking Bell Tower located near the Ilocos Norte Capitol. I was a bit disappointed as every shot taken showed numerous cables blocking my subject. Hello to urbanization! To make our last stop worth it, Paul and I had our second empanada at an open food court nearby. This time, this is Laoag's version of the yummy, crispy snack and I got to admit I still preferred the one at Vigan. Wow, thanks for your very informative blog.. gives me an idea on how to go around Ilocos for this holy week. I'm excited to read about your day 2 and 3! Cool! I really want to go visit soon!! i agree!! lucky u naman u went to the limestone site :) niceeee!! cant wait for the next travel factor trip!